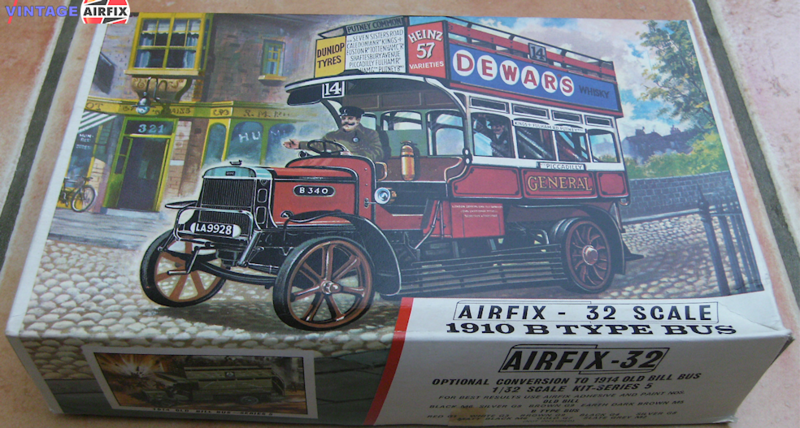 This grand old bus has been designed to the same 1/32nd scale as the Airfix range of Veteran and Modern cars, and might well be displayed with its contempories. A great success in its day, many hundreds were produced. In addition to use over London routes, a considerable number were shipped to Flanders during the 1914-18 war for use as troop carriers and ambulances. This famous bus is made from a 130-part kit which includes driver, conductor, and passengers. In addition there are destination transfers, posters, etc. The 1966 cataloque show the model number as 571, the kit pictured here is from 1966 and has the number as 571 on the box..